The Hidden Gem Estate, offer an oasis of relaxation and repose away from bustling city center with a vibrant plant life. The villa is surrounded by beautiful landscaped gardens, lawns, impressive palm trees and other Mediterranean trees and shrubs as well as many fruit trees such as oranges, lemons and apricots to name a few. The centrepiece of the exterior of the villa is the beautiful private swimming pool perfectly positioned to maximise the guests enjoyment of all-day sunshine and stunning views. In addition, the pool is surrounded by stylish sun loungers and poolside seating, which is ideal for relaxing in the hot afternoon sun. 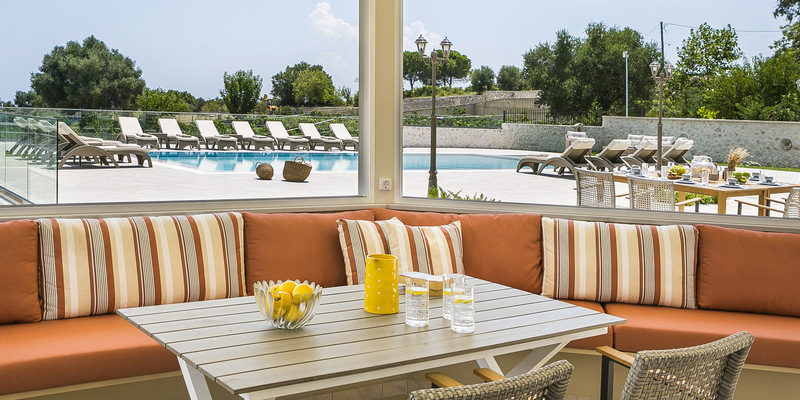 Al fresco meals can be cooked at the outdoor kitchen and BBQ and enjoyed around the large dining table. As well as the summer kitchen there are a BBQ, a dining table and a lounge area to the front with comfortable sofas and chairs. All in all, this is the perfect space for Mediterranean style outdoor summer living.